Here's a fine looking Royal Enfield motorcycle with a few flaws. 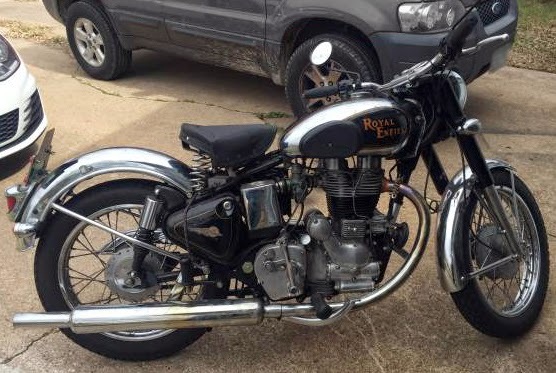 If you own an older Royal Enfield motorcycle you may recognize this owner's plight, as revealed in his CraigsList ad for his 2003 Royal Enfield Bullet in Austin, Texas. I would call his text a study in where the spirit of "press on regardless" becomes a matter of deferred maintenance. But I admire his sense of humor. "For sale is a 2003 Royal Enfield Bullet 500 four-speed single-cylinder thumper. She may not look like much but she's got it where it counts. Usually starts up second to third kick. Neat looking bike. Fun to ride! "Things to note: The gas tank decals are pretty jacked, unfortunately; the tank had a leak when I bought it so they had to boil it out in order to weld a patch. "The charming bungee cords are responsible for holding the storage compartments closed and keeping the center stand up. The locks on the little compartments rattled off a long time ago (this is a single-cylinder bike after-all; lots of vibration) and the center stand spring has sprung. "The transmission on these bikes is old-school and kind of finicky. These bikes are meant to be right-hand shifters, but for the U.S. market they added a linkage underneath to swap it to left-hand shifting. The linkage is where the finicky-ness comes from, but once you get the hang of it, it's not that bad. I've read there are ways to tighten that stuff up, but I just learned to love the oddness. "This is the iron-barreled engine before the AVL and UCE engines; as such it's not so great for highway riding. I've never ridden it faster than 55-60... so it's more for around town or back roads. "And finally, good news! I have a title! Weird, right?